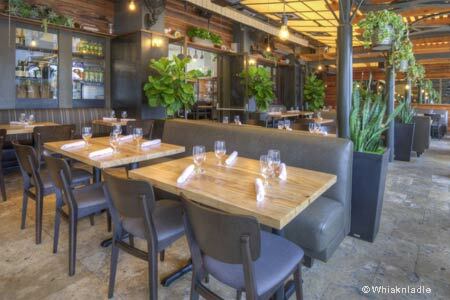 La Jolla’s Whisknladle is known for creative farm-to-table fare. : This popular La Jolla eatery draws a crowd for its cool design, compelling menu and great drinks. Chef Ryan Johnston and proprietor Arturo Kassel have offered different takes on the locally-sourced-ingredient theme. Start with Milagro Farms pomegranate and fig salad with fresh burrata, or steak tartare on Texas toast. Share one of the rotating flatbreads like fennel sausage with arugula or a house-made pasta such as squid ink linguine with sautéed squid and Calabrian chilies. We also recommend the house-cured meats and cheeses, unpretentiously presented on a cutting board with waxed paper; and the fried chicken with sweet corn and peppers in a maple-lemon glaze. Although the wine list is not fine dining caliber, it has been carefully created and contains many fun boutique selections that will appeal to adventurous drinkers.